Moving into a college dorm, managing your own finances, getting to class on time and completing assignments as required—these are all stressful but important steps for a young person when transitioning from high school to university. While many parents are able to help their children navigate this transition, parents of Christel House graduates are not equipped to assist their children in making these critical life choices. Helping your child select a major course of study when you have not completed high school or can barely read yourself is an overwhelming task. To help students bridge this gap, Christel House provides a College & Careers Program. Coordinators provide guidance and counseling during high school, mentoring throughout university studies and coaching as students enter the workforce. International Cruise & Excursions, Inc. (ICE) has adopted the College & Careers program at Christel House Mexico, fully funding the program, as well as providing summer internship opportunities for some of the graduates. “As a company, ICE believes a vital element of business is giving back to those less fortunate. We have been inspired by the extraordinary compassion, commitment and dedication of Christel DeHaan and her talented team at Christel House International. They have provided the foundation for a brighter future for impoverished children, who would otherwise have been facing a very difficult path,” said Marcia Rowley, Co-Founder and Chief Marketing Officer, ICE. 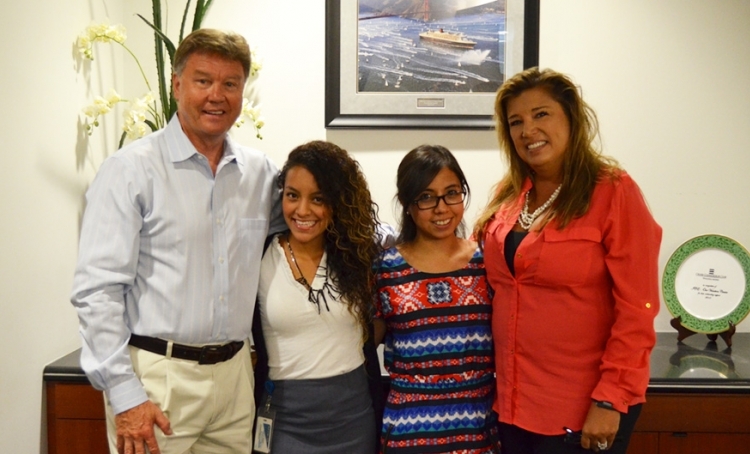 The Senior College & Careers Program at Christel House Mexico provides mentoring for all CH Mexico graduates and the opportunity for 2 – 3 graduates to intern at ICE’s Scottsdale headquarters each summer. “This program has been extremely rewarding for both the students and our employees at ICE. We are committed to continuing our support of the ICE internship program for many years to come,” Rowley said. Internships are commonplace for U.S. college students, but such opportunities are rare for impoverished students. The Christel House Mexico graduates selected for ICE internships spend six weeks working in the department most closely aligned to their university course of study. ICE employees act as mentors and host parents, opening their homes to give students a place to live. The experience is eye-opening for the graduates. “Until I came to ICE, I didn’t really understand how what I was learning in my accounting classes would translate into the real world,” said Maria Dominguez, 2014 Intern. In addition to its corporate funding, ICE hosts Christel House fundraisers throughout the year and encourages employees to participate through payroll deduction programs. In their most recent fundraiser, employees could bid to go to dinner with the ICE executive of their choice and raised over $3,800 from this one effort. Thank you to ICE and its employees for caring, sharing and making a difference.